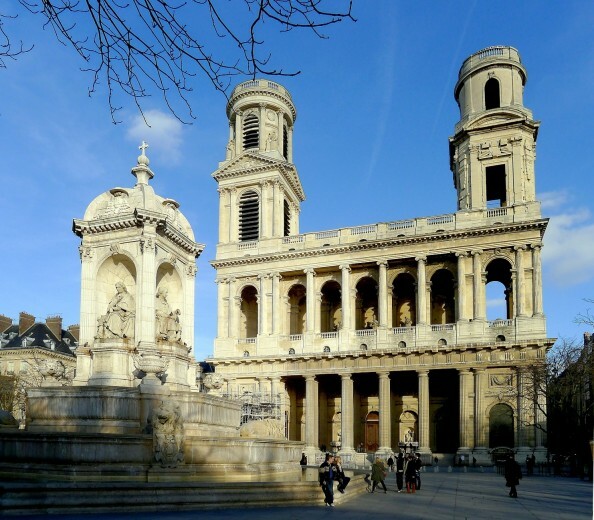 Saint-Sulpice church in is on the east side of the Saint-Sulpice Square in the Luxembourg Quarter is the second largest church in the city after Notre Dame. It is dedicated to Sulpitius the Pious. The ancestor of the telegraph, the Chappe system (moving panel system set on heights) had a fixed place on the roof until 1850. Baudelaire and the marquis de Sade were baptized in this church. Victor Hugo got married here. The Rose Line marks the original zero-longitude line, which passed through Paris. You can retrace his path from the stone statue north across the nave and transept to an obelisk next to the statue of St Peter. The Astronomical Gnomen was commissioned in order to determine the exact date of easter, and the winter and summer equinoxes.